It consists of conductive polymer, two pieces of paralleled metallic conductor and insulation layer. 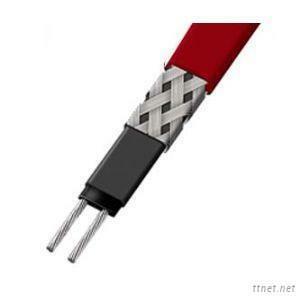 Its conductive polymer has very high plus thermal coefficient and is in parallel connection. Automatic regulation on output power as thermal change of the system being heated results in automatic regulation on heating temperature. There are many choices on the cable length according to the application occasion. The overlapping of the cable is allowed, which results in no extreme heat point or burning. 1. The automatic regulation on output power could be realized on heating part according to the change of heating system, which results in no extreme heat point or burning. 2. Quick start at low temperature; Each part temperature is under automatic regulation results in evenly heating. 3. Easy installation and maintenance, 24 hours in service, high automatic level and low cost of operating and maintaining. 4. Safe, reliable, wide application, environment friendly, long duration.